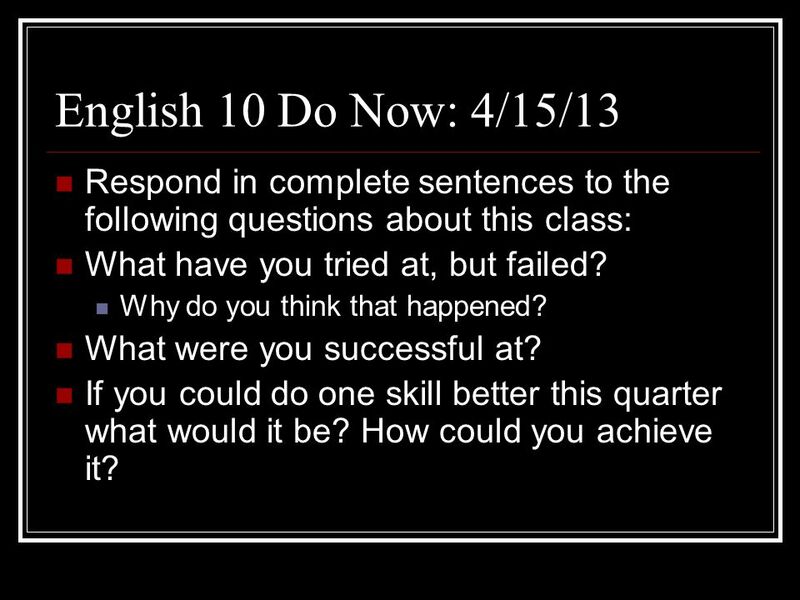 2 English 10 Do Now: 4/15/13 Respond in complete sentences to the following questions about this class: What have you tried at, but failed? Why do you think that happened? What were you successful at? If you could do one skill better this quarter what would it be? How could you achieve it? Reflective writing (with a lil grammar something something, ya’know what I’m sayin?) 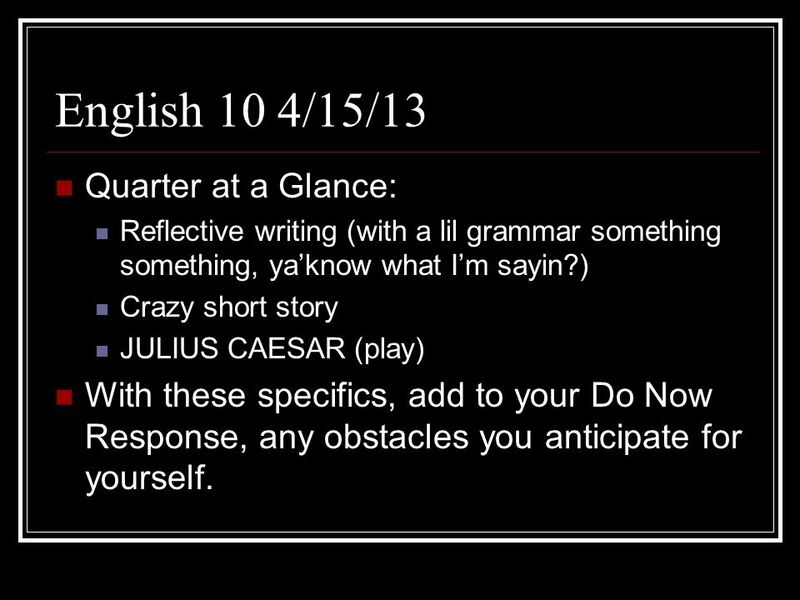 Crazy short story JULIUS CAESAR (play) With these specifics, add to your Do Now Response, any obstacles you anticipate for yourself. 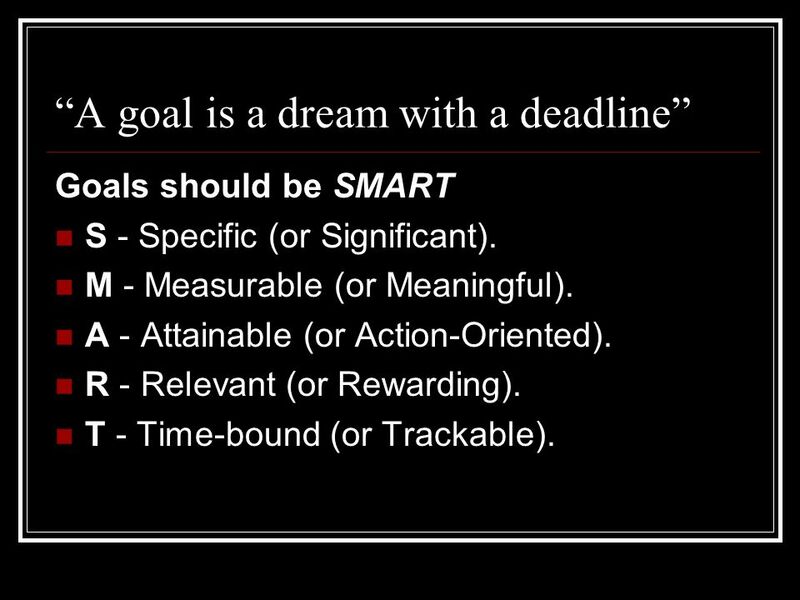 Goals should be SMART S - Specific (or Significant). M - Measurable (or Meaningful). A - Attainable (or Action-Oriented). R - Relevant (or Rewarding). T - Time-bound (or Trackable). Since, I did not turn in much work last quarter, I will make sure I turn in 90% of all homework in order to get my A this quarter. Since I did not participate much last quarter, I will raise my hand at least once a week and take a speaking role when we read Julius Caesar this quarter. Now you try. 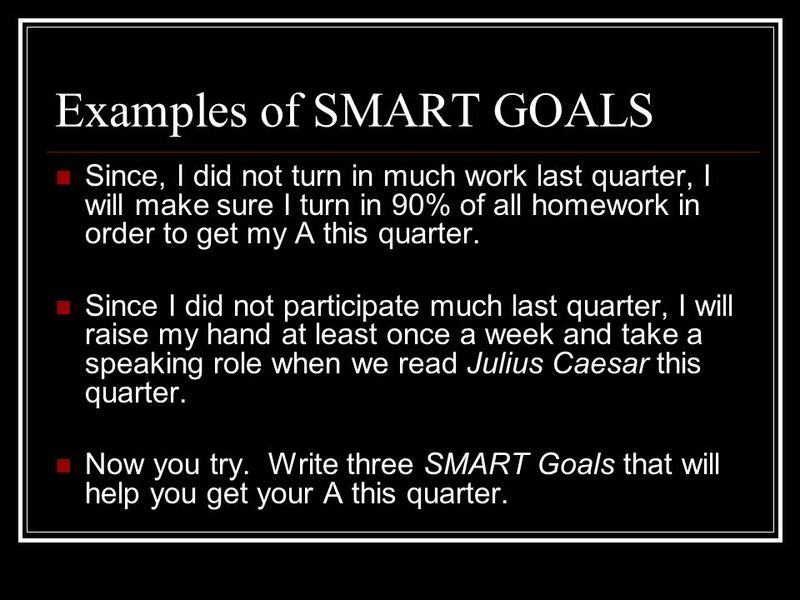 Write three SMART Goals that will help you get your A this quarter. Example goal: Since, I did not turn in much work last quarter, I will make sure I turn in 90% of all homework in order to get my A this quarter. Example steps: Check chshomework.wikispaces.com everyday Get absences excused, ask for make-up work outside of class Find missing Do Nows on wiki too. 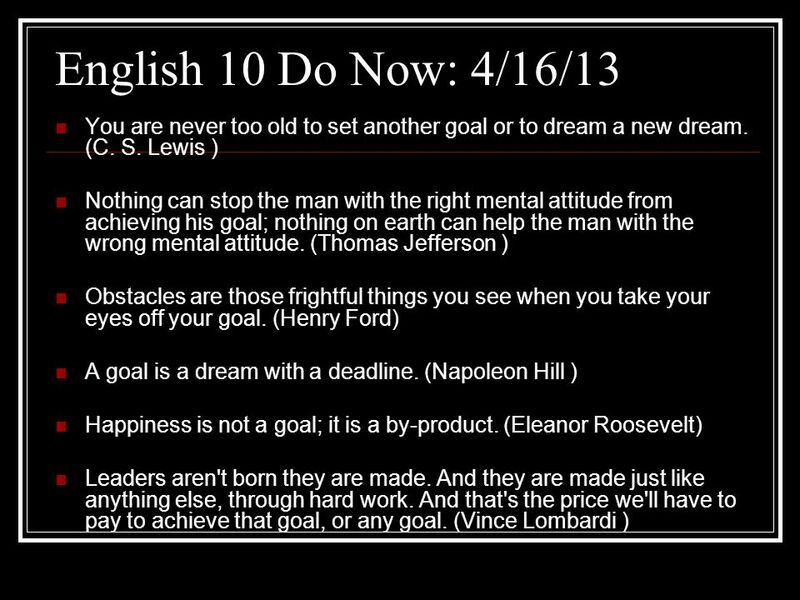 8 English 10 Do Now: 4/16/13 Pick one of the following “goal” quotes (next slide). Copy the quote down and then write three-five sentences telling me why this quote spoke to you or why you picked it over the others or what it means to you. 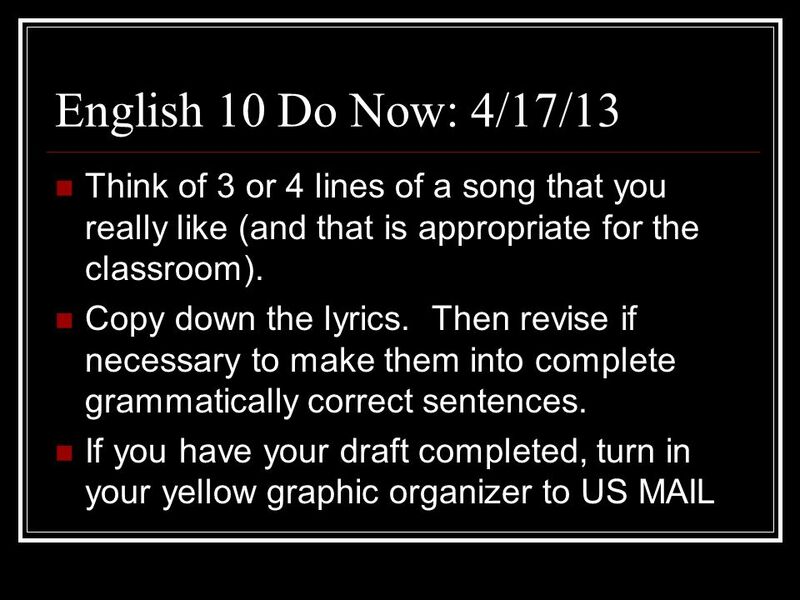 12 English 10 4/17/13 Song grammar practice. 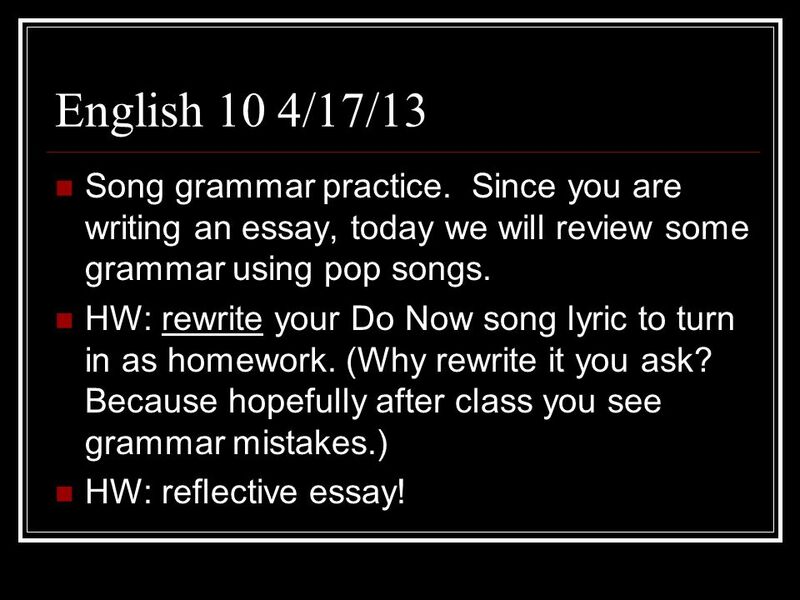 Since you are writing an essay, today we will review some grammar using pop songs. 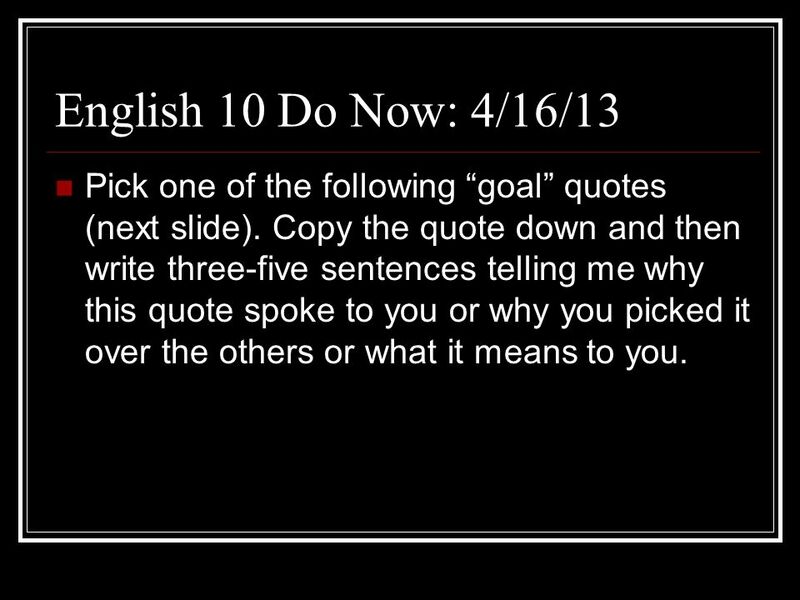 HW: rewrite your Do Now song lyric to turn in as homework. (Why rewrite it you ask? Because hopefully after class you see grammar mistakes.) 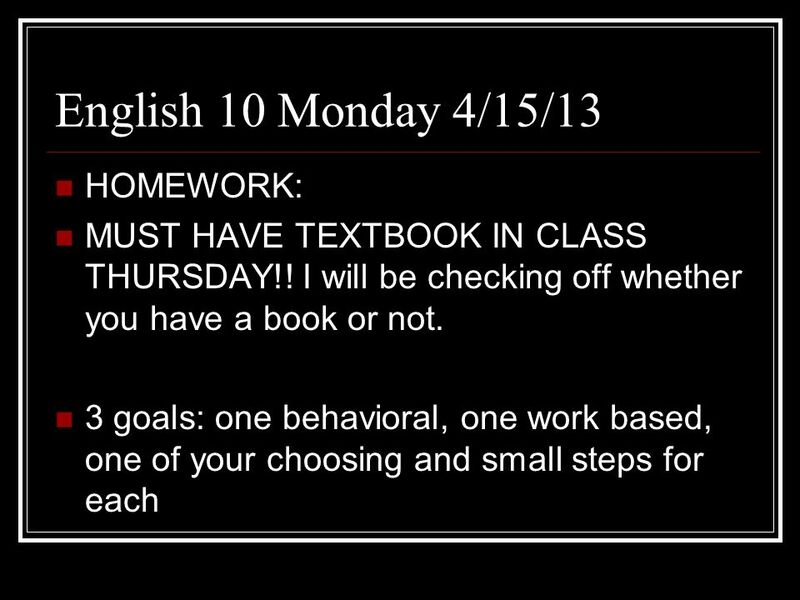 HW: reflective essay! 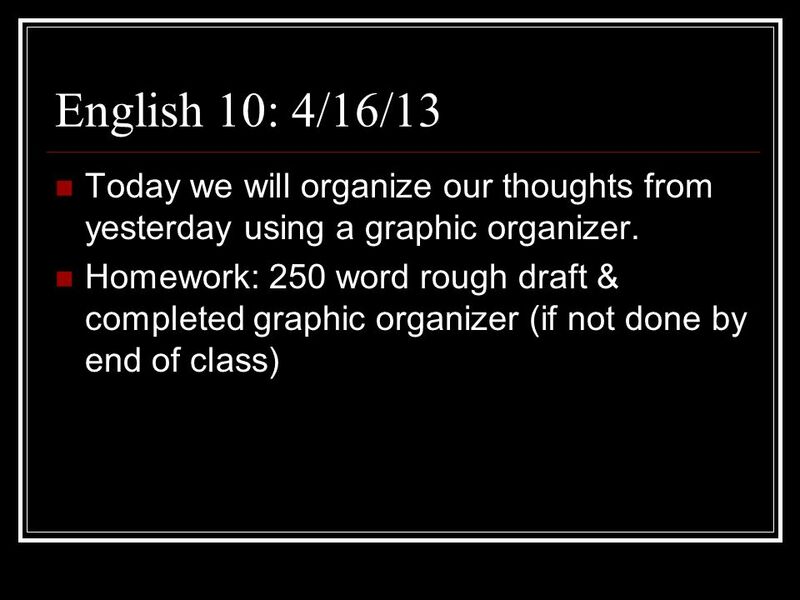 13 English 10 Do Now 4/18/13 Turn in your reflective essay graphic organizer. 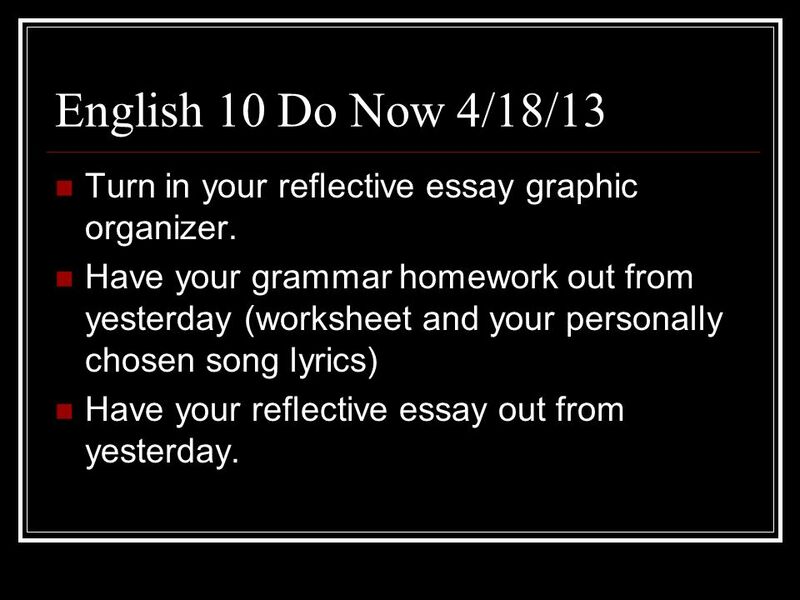 Have your grammar homework out from yesterday (worksheet and your personally chosen song lyrics) Have your reflective essay out from yesterday. 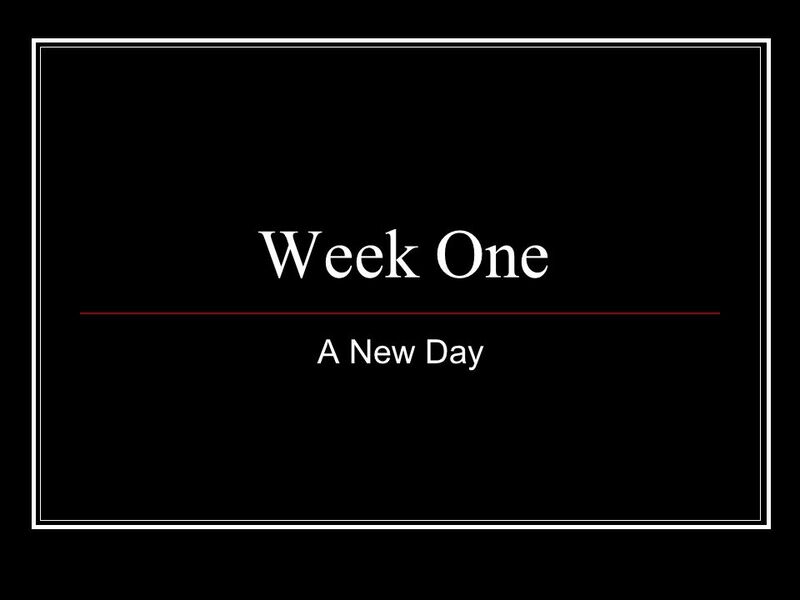 Download ppt "Week One A New Day." 2212 GENERAL ENGLISH Your course overview... SEMESTER FOUR COURSE OVERVIEW This course will develop the English language skills required to perform a. Period 7. (1 … … , (11) (14) work as assembly line bus station divide...into after that at last can't wait to do wrap the doll. September 4— Welcome  Agenda—copy  9/4/13—Syllabus (due tomorrow)  9/5/13—Want Ads (interviewing)  9/6/13—Want Ads (writing)  Syllabus  Read through. 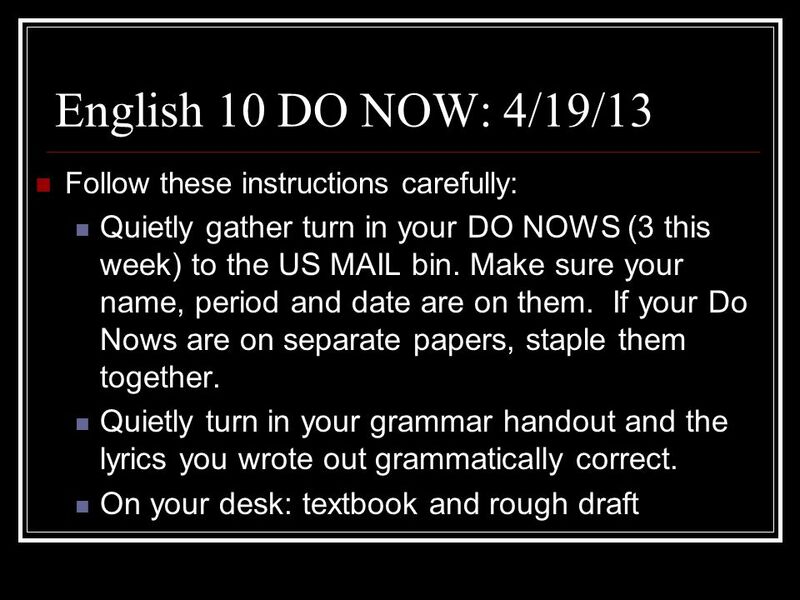 ENGLISH IV: Unit 1 Day 15- Thesis and Introduce Paper. Lytle ISD 17 years LJH = 10 years CLL = 7 years San Antonio Writing Project TC since 2007 Write For Texas Group.